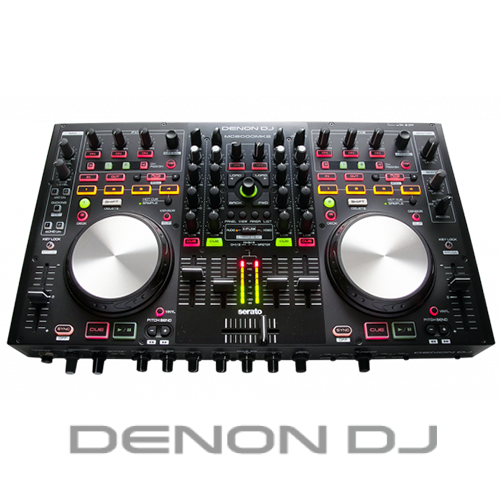 The MC6000Mk2 is Denon DJ’s next generation, flagship professional DJ controller and digital mixer. Created to be the definitive tool for the most discerning of contemporary club and mobile DJ’s, the slimline, table-top steel chassis unit blends a 4 channel/8 source real-time matrix operational digital mixer with an uncompromising 24-bit, class leading digital and analog audio interface. This Mark 2 incarnation operates out of the box with Serato DJ Lite and includes a voucher for Serato DJ Pro (user download – voucher included with purchase). The Mark 2 is fully MIDI-compliant to work with other software solutions via supplied or created mappings. The MC6000Mk2 enables 4-deck functionality, opening up the creative possibilities of 4 deck mixing to all, with the unit’s top panel placing the all important transport, pitch, EQ, loop, hot-cue/sample, navigation and FX controls ergonomically positioned to ensure optimal, error free live performance. DJ’s can now also take advantage of the world renowned video mixing features of the optional Serato Video plug-in allowing them to program, mix, add transition FX and scratch video just as they would with audio. The MC6000Mk2 also supports Serato’s DVS Expansion Pack to connect Turntables or CD decks and control Serato DJ, using Noisemap™ Control Tone records or CDs. Operated as a fully functional DJ software controller or as a stand-alone digital mixer, the MC6000MK2 accommodates a multitude of connectivity options to suit a DJ’s preferred workflow. Table top CD and Vinyl decks, plus auxiliary input sources can easily be integrated, with USB audio input routing adding even more flexibility. During fast-paced, demanding live performances, the real time channel matrix control of the MC6000MK2 ensures fast and efficient DJ hand-overs too.